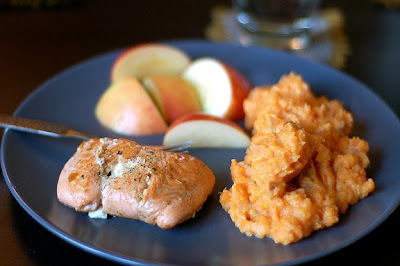 I love sweet potatoes and salmon, such a great simple dinner. 1. 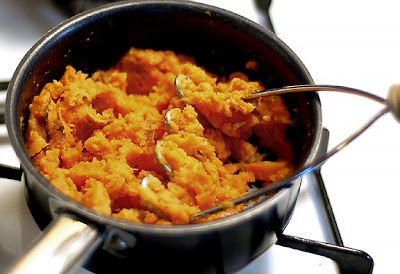 Microwave the potato until cooked through. 2. Cut into small chunks (leave skin on). 3. 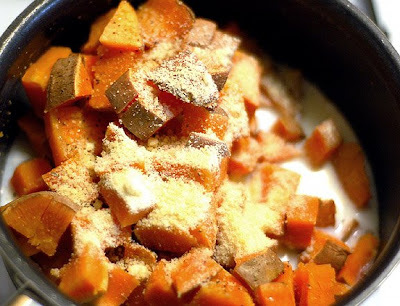 Put into a small pan and add about 1/4 cup of milk, parmesean cheese, a pinch of salt, and a dash of garlic powder. Bring to heat on medium high. Beautifully simple! I like the photos too.